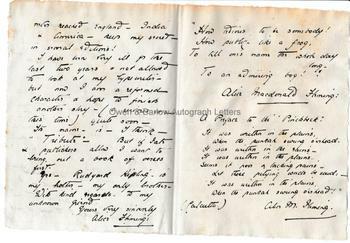 ALICE 'TRIX' KIPLING Autograph Letter Signed. Alice MacDonald Kipling, known as Trix, and as Alice Fleming after her marriage. Author, poet, psychical medium, sister of Rudyard Kipling. ALS. 3pp. 7 via Garibaldi, Firanza, Italia. April 4th 1901. To Miss [Pearl] Faithfull. 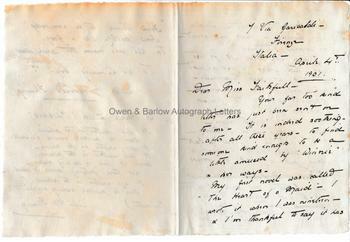 "Your far too kind letter has just been sent on to me. It is indeed soothing after all these years to find someone kind enough to be a little amused by 'Winnie' and her ways. My first novel was called 'The Heart of a Maid'. I wrote it when I was nineteen and I'm thankful to say it has never reached England. India and America - keep my secret - in several editions! I have been very ill for the last two years and not allowed to look at my typewriter - but now I am a reformed character and hope to finish another story (a serious one this time) quite soon. The name is - I think - 'Tribute'. But if fate and publishers allow I want to bring out a book of verses first. Yes - Rudyard Kipling is my brother - my only brother. With kind regards to my unknown friend, yours very sincerely, Alice Fleming. "How hideous to be somebody! How public, like a frog, to tell one's name the whole day long, to an admiring dog!" Alice MacDonald Fleming. A Preface to the "Pinchbeck". It was written in the plains, when the punkah swung o'erhead. It was written in the rains - It was written on the plains. Seems it [...?] a lacking pains - Let these pitying words be said: It was written in the plains, when the punkah swung o'erhead." (Calcutta). Alice M. Fleming." Large 8vo bifolium. 19 x 14 cms (7.5 x 5.5 inches). Fine. The remarkable, mysterious and rather wonderful Trix Kipling grew up with her older brother, Rudyard Kipling, and the two shared magical, happy times in India and the distressing experience of what Kipling called 'the house of desolation', the loveless, austere boarding house in Southsea. Both were artistic talented children and both wrote from an early age. Alice Kipling was, however, to grow up in the shadow of the genius of her more famous brother. 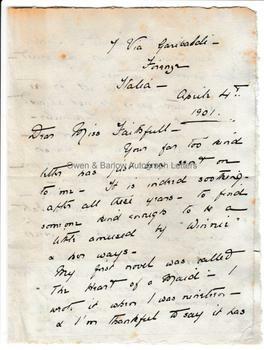 In 1901, the date of this letter, Trix was recovering from her first bout of mental illness. She had been moved from place to place by the family, her husband and her family at odds over how her illness should be treated and this was something she later rather resented. She had begun writing again and 'Her Brother's Keeper' was published later in 1901. Trix's mental illness was to return in 1910 on hearing of the death of her mother and she was troubled by ill health for the next decade. In later years (under the assumed name "Mrs Holland") she became a famous medium, taking part in several well-documented psychic experiments. Although her story full of love, lies and madness, became a family secret, Alice 'Trix' Kipling has been "rediscovered" in recent years and has been the subject of an excellent biography and a fictionalised account of her life. Provenance: From an album compiled by Florence Pearl Faithfull (known as "Pearl"), later Lady Dilke. Pearl Faithfull was the daughter of H.M Faithfull, solicitor of Sydney, New South Wales and the grand-daughter of the Australian pioneer and politician William Pitt Faithfull. In 1915 she married Sir Charles Wentworth Dilke but following his insanity and subsequent death in 1918 she returned to Australia.